Should I Tip for Counter Service? Can you guys do a column (if you haven’t already) on tipping for counter service/food pickup?? I always feel awkward when paying with a credit card and it has a line for tips. The Emily Post Institute covers a wide range of tipping suggestions. For takeout, they say no obligation or perhaps 10% for a large order or curb delivery. Tip jars also have no obligation, though perhaps you might throw something in if you are a regular or get extra attention. The Billfold has a charming post on tipping at food trucks which covers the gauntlet of the debate on counter service tipping. Jaya: I don’t always tip with counter service. Am I a bad person? Victoria: Psh, no. I rarely tip for counter service. I feel like this is the kind of tipping situation where you only need to do it if people legitimately go above and beyond, like starting your coffee order when you walk in. Jaya: Yeah, if I pay in cash I’ll probably leave some change? if there’s a dime or two. Victoria: But if someone is just slicing a bagel, throwing some cream cheese on it and handing it to you…. I don’t see it as much different than any other kind of retail service. Jaya: Definitely. Though what are the labor laws? It’s not like waiters where they are living off tips, right? At least in America. Victoria: Right, they get paid at least minimum wage. Now whether that is fair or right or not is a whole different issue. Btw, did you know that in some states, like CA, waiters must be paid minimum wage? They don’t get this whole “service wage” plus tips, but then they still get tips because everyone is used to tipping waiters. Victoria: Or at least that is how it is supposed to work, I don’t really know if it does in practicality though. I do think if you get takeout from an actual restaurant where the waiters are packing up your food for you, then you should tip, perhaps a bit less than normal- more like 10-15% to compensate them for their time lost from waiting at a table. Jaya: Yeah. I am actually fascinated in how tipping has changed since Seamless and other online ordering things came along. Jaya: I think so. It sort of automatically calculates it. You can change it, but if you don’t do anything and just click “order” it’s already thrown in a couple bucks. Jaya: And I forget if it’s the same amount I would have tipped had I paid in cash. Victoria: It’s pretty low, I always bump it up because delivery is the type of service you should be tipping for (though I don’t tip nearly as much if I am picking it up after ordering through Seamless). Tipping always causes so much debate! Share with us your thoughts and experiences with tipping in the comments! I think it depends. If you’re at a coffee shop and you order something more complicated than a drip coffee, treat it like you would a bartender, particularly if you’re getting something like a half-caf vanilla latte with extra foam. That tip jar at the counter gets split between everyone on shift andreality is that minimum wage isn’t a living wage and that extra dollar helps. But, for the most part, I don’t tip at a counter, though I do tip for delivery. Good point! Yeah, my coffee order rarely exceeds “coffee with milk, no sugar” so that’s not that complicated. But if you have a really custom order you should make sure to tip accordingly. I’m old enough to remember when tip jars for counter service began to appear in the 1970s. Now, and for a long time, they’re ubiquitous. 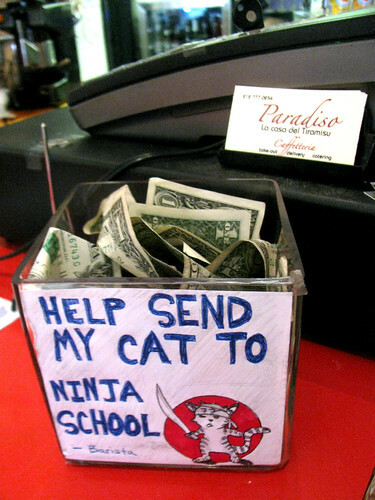 From when they first started to appear this tip jar concept seemed incongruous. Would I tip the Macy’s salesclerk even if he helped me select the nicest color tie for my outfit? I believe all workers should be compensated fairly for the job they’re doing by their employer–not their customers. If I stick a tip in the counter jar or add it on to the electronic screen prompting me for a tip amount or a “no tip” option (very obnoxious) for the cheery agent that brightened my day or gave me some special consideration, do I even know that they’re receiving it–I didn’t intent to tip all the employees there. Table service is different, though, because you can be the judge between excellent, fair and poor service, and that’s a part of the contract.